Where preventive action is not possible remedies should be used at the very first indication of trouble. This saves expense. IT pays commercial growers of fruit to fight pests and diseases from one year’s end to the other. They carry out preventive, trapping and killing operations on a very large scale. The home food grower’s produce seldom comes up to shop fruit standard for the simple reason that he docs not engage in a similar conflict on his own; or he does it only half-heartedly. The cost of materials is insignificant compared with the value of crops from clean trees and bushes. Not only are such crops bigger but they are far better in quality. No spraying solution, dusting powder or other device will make a clean sweep of every fruit pest and disease, but each docs a very great deal towards reducing the total number of troubles. The accompanying chart, ‘Remedies Against Enemies of Fruit Crops’, gives a concise survey of methods of dealing with specific troubles. These methods are to be applied at the times and seasons indicated, and the home grower should realize that preventive measures can be carried out more effectively than operations during the height of the rotting or mummified fruits, whether on the ground or still clinging to the trees, should be collected and either burned or buried deeply. Trees or bushes should then be sprayed, forcefully, with a tar oil winter wash (bought in tins) used according to the maker’s directions. This rids the bark of moss and lichen and largely smashes the grand spring assault – before it can start – of quite a number of different insect pests by destroying their eggs, pupce and hibernating grubs. Tar oil winter wash is far more effective than the old-fashioned plan of lime washing fruit tree trunks, apart altogether from the fact that every partof a tree can be reached with the winter wash applied as a spray – whereas the lime washers stop at the trunk. It is not to be used except when buds are dormant, otherwise damage will be done. That limits this phase of the fight to the period between early December and the middle or end of January. Fruit trees trained against walls become active rather earlier than those away in the open, and it may be necessary to spray these with the tar oil wash during the last weeks before the end of the year. There is no point in leaving this spraying to the last possible moment. Round about Christmas or the first week of the New Year one bout of spraying could take in all the bush and tree fruits in the garden. Preparing and Applying the Spray. Only as much of the liquid should be prepared at any one time as may be required for immediate use. It is to be mixed with water according to directions accompanying it. Quantity needed depends on the number and size of trees and bushes. These are to be coated from top to bottom, from shoot ends to base of trunk or stem, until the liquid starts to drip off. The more forceful the spray the more effective it is, so the winter spraying apparatus should be fitted with a rather coarse nozzle – this enabling the solution to be driven into all crevices in the bark. An ordinary garden syringe serves for young standards, dwarf bush trees, pyramids, and trained trees in general, for gooseberries, currants and the like. Where pumping assistance is available the ordinary stirrup pump, given a coarse nozzle, will do the job still better; something of that sort is really essential in dealing with tall trees. Knapsack sprayers and other forms of apparatus may be purchased. However the spray is applied, the operator should move around the tree or bush so that every part of trunk and limbs is covered from every possible angle, the upper surfaces of top growth to be welled as thoroughly as the undersides. It should be noted that no spray can be under control in windy weather, and the job should not be embarked upon during frost or when rain is likely to follow within a couple of days. A downfall of rain can wash practically all the liquid off. Old clothes should be worn, and gloves if possible, and a cap pulled well down will protect the operator’s face and eyes. It is no use denying that spraying is a messy job. Vegetables or other plants under or near to the trees should be covered over – sheets of newspaper are effective – -whilst operations are in progress. If the liquid reaches them (or a nearby hedge) it should be hosed off at once with water. These precautions apply in all cases, whatever the nature of the spray. Also the work is made easier if the solution, whatever it may be, is strained through coarse muslin before operations begin, to prevent the nozzle clogging. Last stage in the operations consists in cleaning the apparatus thoroughly, inside and out, with clear water, then drying it before it is put away. Lime sulphur solution is an excellent spring wash for applying to apple and pear trees whose fruits the previous season were attacked by scab, the spray to be applied just before the flower buds open. 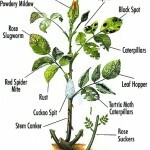 It is used also against black currant big bud mite, American gooseberry mildew, and fruit tree red spider. Details are given in chart. 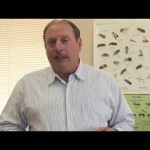 Lead arsenate (poison) is a spray for killing spring grubs by poisoning their food. This must not be allowed to make contact with any vegetables in the vicinity. Sprayed over apple trees as soon as the flower petals have fallen it will greatly reduce the number of maggoty windfalls. Dcrris insecticide and quassia solution each have their uses in connexion with other pests, as indicated in the chart. Small and early windfall apples are often due to the core-eating activities of the grub of the codlin moth. This grub originates from an egg laid in the centre of the flower. It enters through the eye of the small fruit, eats the core, gnaws its way out through the side and climbs down the tree trunk to the ground. There it buries itself, becomes a pupa and eventu-ally emerges as a fuJl-size codlin moth. To prevent these codlin moth grubs entering the apples the trees should be sprayed with lead arsenate – when bees have finished with the blossom, so that these shall not be poisoned too. As soon as the petals have fallen the lead arsenate solution is sprayed through a fine nozzle over the bloom trusses so that the poison lodges in the eye of each forming fruit. Grubs attempting to eat their way in have also to eat the poison, and that is the end of them. Band Traps on Fruit Trees. There is another way of defeating the codlin moth grub, without spraying; though both methods might well be adopted, to make assurance doubly sure. This second plan is to tie a 6-in. wide band of old frayed sacking, or else of thick crumpled paper, around the tree trunk in June; – in readiness for the downward procession of full-fed grubs. The latter halt at the obstacle and either die in its folds or enter the pupa stage. When the fruit has been gathered in autumn these dry bands are removed and burned with all pests lodging therein. When the dry bands are removed with their codlin moth grubs and other incidental lodgers they might well be replaced by grease bands. These sticky traps are to catch the feet and bodies of the parents of another type of grub – those which loop about the foliage and eat it. These looping grubs, progeny of certain winter moths, attack not only apple but plum, damson, cherry, nut trees, gooseberry and currant bushes.They eat buds, blossom and young fruit as well as leaves. They spin leaves together and lurk therein between feeds, and they do the same with flower heads. For the sake of the fruit they must be killed by spraying with lead arsenate after the flower petals have fallen. Any of these looping grubs that manage to survive and eat their fill let themselves down on self-spun threads, during May to June, and bury themselves in the soil or any rubbish at the foot of the tree or bush. There they pass through the pupa stage and become moths. The female winter moths desire to lay eggs on the shoots and branches. But they are unable to fly; their wings never develop sufficiently to lift them from the ground. So they crawl up the stems or trunks, to set the whole cycle of trouble going again. It is important that the home fruit grower should know all this. Knowledge of their peculiar habits enables him to outwit them when their upward procession begins, about mid-October. He traps the crawling, would-be egg layers with grease bands. Where it is not practicable to fit these – because of lack of sufficient length of un-branched stem – he sprays in winter with tar oil wash and in spring with arsenate of lead. How to Use Grease Bands. Paper bands for tying around the stem or trunk, and grease to spread on the bands, are sold by horticultural dealers. At about the end of September a paper band should be wrapped around the trunk of each tree to be protected, and tied there firmly, with two pieces of string; each piece of string – one at the top, one at the bottom – to be about 1 in. in from the paper edge. The paper is then smeared with the grease, not smoothly in flypaper fashion but in thick ridges; it remains sticky for a longer period when so applied. The grease is not to come in contact with the bark, but should be confined to that area of paper which is between the two strings. The band should be high enough from the ground to escape mud splashes during rain. If it becomes coated with soil the flightless winter moths will crawl over it without being caught in the grease. Bush. trees and pyramids present some difficulty here. This can sometimes be met by banding the lowest branches, as well as the short stem at a point immediately below the head. A tree supported by a stake needs an additional grease band – to encircle the stake. Otherwise the moths will by-pass the trunk band and use the stake as their high road. Trees no longer in their youth sometimes have rugged bark which provides a number of easy paths under the encircling grease band for the small winter moths. When dealing with a trunk of that description, the bark crevices should be stopped with wet clay over the area where the band is to be fastened. The bands are to remain in position until April. They should then be removed and burned. It is as well to inspect the bands occasionally during winter; the grease may have hardened, or become soil splashed, or studded thickly with its captives. A little scraping of the surface will expose a new stickiness. The codlin moth is not, unfortunately, the only pest responsible for windfall apples. The apple sawfly docs its share in the work of destruction and – again unfortunately – spraying is of no avail against it. From an egg laid in the flower a grub emerges, but instead of eating its way into the tiny fruit through the eye, as does the codlin moth grub, it goes in through the side; and not sufficient poison spray is retained on the side to kill the sawfly grub as it gnaws an entry. This grub does not confine itself to the core (like the codlin moth grub) but eats out a large cavity, then leaves by another hole in the side. It may then enter another apple, and continue die feast. Fruit which it attacks fall to the ground in June or July. Hole-marked apples should be picked from the tree before they fall, in the hope that the grub will still be within; though it may already have made its way to the ground. Fallen fruit should then be collected to prevent any grubs still therein making their way into the soil. More or less safe in the ground, the grubs go through the pupa stage of transition and the following spring emerge as mature saw-flies. Much can be done to prevent this transition by cleaning the soil, as explained below. Bits of prunings, leaves, fallen fruit and any other rubbish accumulated at the base of trees and bushes should be gathered up and burned in winter; a number of pests of various kinds will be destroyed in the process. If chickens can be allowed to run in the fruit quarters for a time they will scratch over the surface soil and disinter and eat many pupa; and grubs wintering there. An alternative plan is to remove 1 in. or so of the surface soil and replace it with soil taken from the vegetable ground; the removed soil to be buried in the bottom of a trench during digging. If the old surface soil must remain, soot or lime or both might be raked into it; or naphthalene forked into the top 2 in. at the rate of about 2 ounces per square yard. In dealing with under-glass vines, peaches, nectarines when their leaves have fallen in winter, the after-pruning, pest-abolishing programme consists in painting or lightly washing all the wood – every bit of it – with Gishurst compound. The vine or tree should be unfastened from the wires or trellis or whatever supports it and treated with the compound – made into a solution according to the directions accompanying it. The liquid is then applied with a stiff brush, or small scrubbing brush, worked from the bottom upwards so that the dormant buds are not in any way injured. It should be well worked into the spurs of the grape vine, and should extend to the tips of every side shoot of peach or nectarine. FRUIT TREES Insects’-eggs, moss, Spray with a tar oil winter wash, AND BUSHES lichen I pint to each 2 gall, of water, GENERALLY early December to late January. This is a general cleanser. APPLE American blight Dab the bits of white ‘fluff’ (woolly aphis) on (these conceal sap – sucking branches, trunks aphides) with a stiff brush dipped in methylated spirit, petrol, paraffin or tar oil winter wash, as soon as noticed. APPLE, PLUM, has been gathered. Grubs ‘ loop ‘ about Spray with arsenate of lead, as CHERRY, on foliage and eat it above. Also grease-band trunks, GOOSEBERRY, late September, to trap the wing- CURRANT less moths responsible for the grubs. Remove and burn the grease bands, together with the wingless moths and other pests trapped in the grease, in early APPLE, PEAR spring. APPLE, PEAR, eaten away ficing most, or all, of a branch. Scale on stems, Spray with tar oil winter wash, GOOSEBERRY, branches and shoots when buds are completely dor- CURRANT mant. 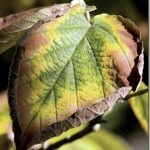 BLACK CURRANT Big bud mite Spray with lime sulphur solution, A pint lime-sulphur to 3 gall. of water, when leaves are as large as a shilling and before the flower buds are open.